Dr Guang Hong is Associate Professor in the Mechanical & Mechatronic Engineering Program. 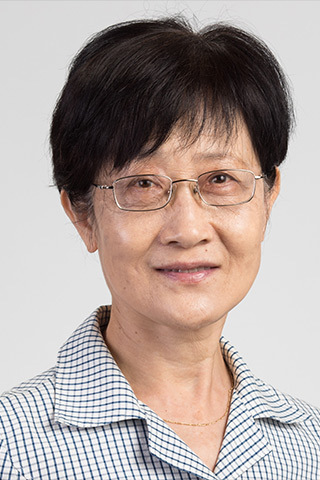 She received her undergraduate degree in 1976 and Master's degree in 1982 from the Huazhong University of Science & Technology (HuazhongUST), China, and her Ph.D. in 1989 from the University of Cambridge, U.K, all in the area of internal combustion (IC) engines. Dr Hong has been working at UTS since 1990, Research Fellow from 1990 to 1991, and Lecturer from 1992 to 1997. She was promoted to senior lecturer in 1997 and Associate Professor in 2003. Dr Hong's research is in the IC engines and thermofluids areas. Her research is presently focused on developing new techniques for using renewable fuels more effectively and efficiently. Dr Hong is a core member of the Centre for Green Energy & Vehicle Innovation (GEVI) which is one of the Research Strengths at UTS. Dr Hong is close to retirement and will not take new PhD students. Fellow, Society of Automotive Engineers Australasia (SAE-A); Member, SAE (U.S. based). Ethanol direct injection plus gasoline port injection (EDI+GPI) engine. 48651 Thermodynamics, Coordinator and lecturer. 49322 Air Conditioning, Coordinator and lecturer. 49307 Internal Combustion Engines, Coordinator and lecturer. © 2019 Elsevier Ltd Indirect evaporative cooler (IEC) is a clean cooling device in development for air conditioning systems. It uses the water to partially replace the refrigerant and can be applied as a standalone cooling system or an energy recovery ventilation system. Driven by the concern about the sustainability, IEC has been required to reduce the power to operate and increase its capacity in order to reduce the energy consumption and increase the overall efficiency of the air condition system. The water distribution over the plate walls in the cooler is a key factor affecting the IEC performance and efficiency. This study investigates the effect of a novel suggested water spray configuration on the performance of a ventilation energy recovery IEC. Experiments were conducted to investigate three water spray modes: external spray, internal spray and mixed internal and external sprays. The results show that the mixed mode performs best and internal spraying mode performs better than the external spraying mode does in terms of the wet-bulb efficiency, cooling capacity and the COP of IEC. The mixed mode improves the performance further by increasing wettability. This study was aimed to develop a chemical heat storage system using magnesium hydroxide (Mg(OH)2) and its dehydration and hydration reactions to recover the energy wasted in internal combustion engines (IC engine). The thermal energy of exhaust gas will be stored in the dehydration of Mg(OH)2 to become MgO and H2O, and to release in the hydration of MgO. Experiments were conducted on a 6-cylinder spark ignition engine to estimate the amount of energy loss in the exhaust gas and the reactor efficiency in the dehydration process. The stored heat used to heat fresh air from the ambient temperature to more convenient temperature. Results of the preliminary investigation show that the proposed chemical heat storage system is feasible to recover approximately 5.8 % of the heat loss and the temperature of the air is from 275.5 K to 305.4 K (with the ambient temperature is from 253 K to 283 K and the water vapor pressure is 47kPa). © 2018 American Chemical Society. A spark ignition (SI) engine with an ethanol direct injection (EDI) and gasoline port injection (GPI) system has been studied quite recently. In order to investigate its application, experiments were carried out on a single-cylinder 250 cm 3 short stroke motorcycle SI engine, which is supplied with the ethanol-gasoline dual injection system. Experimental findings have revealed that EDI helped increase the lean combustion limit owing to the combination effects of the dual injection and ethanol fuel. At the identical engine speed and load, the lean burn limit in the dual injection model was, on average, 0.2 times higher than that in the corresponding single GPI model. Increasing ethanol energy ratio (EER) gave rise to the increase in the lean burn limit; nevertheless, the increase rate began reducing when the EER was above 48% and 42% at 4000 and 3500 rpm, correspondingly. Subsequently, late ethanol direct injection (LEDI), following the intake valve closing slightly extended the lean burn limit, probably, owing to the unsatisfactory mixture quality. Early ethanol direct injection (EEDI) prior to the intake valve closing was more helpful in increasing lean burn limit as compared with the LEDI. Nonetheless, further advance of spark timing earlier than 35 crank angle degress before top dead center (CAD BTDC) in LEDI situation, in addition 30 CAD BTDC in EEDI situation, might lead to reduction of the lean burn limit. © 2018 Elsevier Ltd and IIR Ventilation heat recovery is a system that requires low power to operate and has a high capacity to reduce the energy consumption and increase the overall efficiency for air conditioning. This paper reports the experimental investigation of air-to-air heat exchangers employed for heat recovery ventilation in cooling mode. The two main objective of this research are to design, fabricate and testing two polymers heat exchangers of different plate geometries and to evaluate and compare the thermal performance two quasi-counter flow plate heat exchangers. The key aims were to evaluate the effect of the surface geometry of the plates heat exchanger on the performance parameters specified in ANSI/ASHRAE Standard 84 and ANSI/AHRI Standard 1060 and narrow the gap of the limited experimental comparison of polymers sensible heat exchanger in cooling mode. The experiments were conducted on two polymer heat exchangers, one with a flat plate and the other with a dimpled surface plate. The experimental results showed that the cooling capacity of the dimpled surface heat exchanger as ventilation heat recovery system in cooling mode was 50–60% better than that of the flat surface plate heat exchanger. In addition, the sensible efficiency of the dimpled surface heat exchanger was higher than that of the flat surface plates heat exchanger at lower air velocities and higher air initial temperatures. The highest COP was 6.6 achieved with dimpled surface heat exchanger under primary air operating temperature of 32.6 °C. © 2018 Elsevier Ltd Road transport consumes significant quantities of fossil fuel and accounts for a significant proportion of CO2 and pollutant emissions worldwide. The driver is a major and often overlooked factor that determines vehicle performance. Eco-driving is a relatively low-cost and immediate measure to reduce fuel consumption and emissions significantly. This paper reviews the major factors, research methods and implementation of eco-driving technology. The major factors of eco-driving are acceleration/deceleration, driving speed, route choice and idling. Eco-driving training programs and in-vehicle feedback devices are commonly used to implement eco-driving skills. After training or using in-vehicle devices, immediate and significant reductions in fuel consumption and CO2 emissions have been observed with slightly increased travel time. However, the impacts of both methods attenuate over time due to the ingrained driving habits developed over the years. These findings imply the necessity of developing quantitative eco-driving patterns that could be integrated into vehicle hardware so as to generate more constant and uniform improvements, as well as developing more effective and lasting training programs and in-vehicle devices. Current eco-driving studies mainly focus on the fuel savings and CO2 reduction of individual vehicles, but ignore the pollutant emissions and the impacts at network levels. Finally, the challenges and future research directions of eco-driving technology are elaborated. Remote sensing provides a rapid detection of vehicle emissions under real driving condition. Remote sensing studies showed that diesel nitrogen oxides emissions changed little or were even increasing in recent years despite the tightened emission standards. To more accurately and fairly evaluate the emission trends, it is hypothesized that analysis should be detailed for individual vehicle models as each model adopted different emissions control technologies and retrofitted the engine/vehicle at different time. Therefore, this study was aimed to investigate the recent nitric oxide (NO) emission trends of the dominant diesel vehicle models using a large remote sensing dataset collected in Hong Kong. The results showed that the diesel vehicle fleet was dominated by only seven models, accounting for 78% of the total remote sensing records. Although each model had different emission levels and trends, generally all the dominant models showed a steady decrease or stable level in the fuel based NO emission factors (g/kg fuel) over the period studied except for BaM1 and BdM2. A significant increase was observed for the BaM1 2.49L and early 2.98L models during 2005-2011, which we attribute to the change in the diesel fuel injection technology. However, the overall mean NO emission factor of all the vehicles was stable during 1991-2006 and then decreased steadily during 2006-2016, in which the emission trends of individual models were averaged out and thus masked. Nevertheless, the latest small, medium and heavy diesel vehicles achieved similar NO emission factors due to the converging of operation windows of the engine and emission control devices. The findings suggested that the increasingly stringent European emission standards were not very effective in reducing the NO emissions of some diesel vehicle models in the real world. Rate models for predicting vehicular emissions of nitrogen oxides (NO X ) are insensitive to the vehicle modes of operation, such as cruise, acceleration, deceleration and idle, because these models are usually based on the average trip speed. This study demonstrates the feasibility of using other variables such as vehicle speed, acceleration, load, power and ambient temperature to predict (NO X ) emissions to ensure that the emission inventory is accurate and hence the air quality modelling and management plans are designed and implemented appropriately. We propose to use the non-parametric Boosting-Multivariate Adaptive Regression Splines (B-MARS) algorithm to improve the accuracy of the Multivariate Adaptive Regression Splines (MARS) modelling to effectively predict NO X emissions of vehicles in accordance with on-board measurements and the chassis dynamometer testing. The B-MARS methodology is then applied to the NO X emission estimation. The model approach provides more reliable results of the estimation and offers better predictions of NO X emissions. The results therefore suggest that the B-MARS methodology is a useful and fairly accurate tool for predicting NO X emissions and it may be adopted by regulatory agencies. evaporation of EDI spray under different fuel temperature conditions. The results showed that the non-evaporating spray's characteristics were similar to the normal-evaporating sprays' in terms of spray tip penetration, angle and projected area. When the fuel temperature increased from 350 K to flash-boiling spray, the spray angle and projected area reduced significantly, but the spray tip penetration increased. Increasing the fuel temperature from 275 K to 325 K did not cause significant increase of the evaporating rate, but with further increase of the fuel temperature, the ethanol spray's evaporation became faster. The transition temperature at which the ethanol spray collapsed at atmospheric pressure was between 355 K and 360 K.
- A hybrid turbulent transport controlled and soot oxidation rate model is provided. - The simulated precision is improved compared with original soot model. - The model predicts a stronger dependence of the soot oxidation rate on the turbulent. - Soot emission increases significantly with retarding of the fuel injection timing. - Results from numerical model are reasonably consistent with experimental data. Ethanol has been used as an alternative fuel or fuel addicts in spark ignition (SI) engines for years. However, the existing methods of using ethanol fuel, such as blending gasoline and ethanol, pure ethanol and by-fuel of ethanol or gasoline do not make the best use of ethanols potentials in improving engine performance. Compared with gasoline fuel, ethanol fuel possesses greater octane number and latent heat of vaporization, which allow higher compression ratio and consequently lead to the increased thermal efficiency. Ethanol fuels higher combustion velocity could also help increase the combustion efficiency and minimize the energy loss. This paper reports our preliminary investigation to the leveraging effect of using ethanol direct injection plus gasoline port injection (EDI + GPI) on reducing the consumption of gasoline fuel. Experiments were conducted on a YBR250 engine which was a single cylinder SI engine modified to be equipped with EDI + GPI. At each of the four designated engine speeds, the engine load was set to be either medium or light and the ethanol/gasoline energy ratio (EER) was varied from 0% to 60.1%. The rate of the total heating energy of two fuels was kept constant in one of the two engine load conditions. Experimental results were analyzed and discussed in terms of engine performance, in-cylinder combustion characteristics and engine emissions. They showed certain leveraging effect of using ethanol fuel by the increased BMEP, volumetric efficiency and thermal efficiency and reduced NO with the increase of EER. In this paper, an Electronic Control System (ECS) is designed to manage a 125cc single cylinder air-cooled motorcycle engine. The aim of this study was to accomplish low cost, high reliability and mainly meet the motorcycle engine emission standard of China Stage III. In this paper, a cyclic constitutive model is developed for high-strength concrete (HSC) confi ned by ultra-high-strength and normal-strength transverse reinforcements (UHSTR and NSTR), with the intention of providing effi cient modeling for the member and structural behaviour of HSC in seismic regions. The model for HSC subjected to monotonic and cyclic loading, comprises four components; an envelope curve (for monotonic and cyclic loading), an unloading curve, a reloading curve, and a tensile unloading curve. It explicitly accounts for the effects of concrete compressive strength, Volumetric ratio of transverse reinforcement, yield strength of ties, tie spacing, and tie pattern. Comparisons with test results showed that the proposed model provides a good fit to a wide range of experimental results. In the development of synthetic jet actuators (SJAs) for active flow control, numerical simulation has played an important role. In controlling the boundary layer flow separation, an integrated numerical model which includes both the baseline flow and the SJA is still in its initial stage of development. This paper reports preliminary results of simulating the interaction between a synthetic jet and a laminar separation bubble caused by adverse pressure gradient in a boundary layer. The computational domain was three-dimensional and Large-eddy simulation (LES) was adopted. The initial and boundary conditions were defined using or referring to our wind tunnel experimental results. Prior to numerically simulating the interaction between the synthetic jets and the baseline flow, a numerical model for simulating the separation bubble was developed and verified. In the numerical model including the SJA, the synthetic jet velocity at the exit of the SJA was defined as an input. The numerical model was further verified by comparing the simulation with experimental results. Based on reasonable agreement between the numerical and experimental results, simulations were carried out to investigate the dependency of flow control using synthetic jets on the forcing frequency, focused on the lower frequency range of the TollmienSchlichting (TS) instability, and on the forcing amplitude which was represented by the maximum jet velocity at the exit of the SJA. Supporting the hypothesis based on the experiment, LES results showed that the forcing frequency had stronger influence on SJAs effective elimination of the separation bubble than the forcing amplitude did. This paper reports our work on numerical modeling of a micro synthetic jet in a boundary layer with flow separation caused by an adverse pressure gradient. The numerical model was developed using a commercial code with three-dimensional Large Eddy Simulation (LES) being applied. The model was verified by experimental results. The numerical results enabled flow visualization which helped us understand the evolution of a synthetic jet between the synthetic jet actuator (SJA) and the onset of separation, which was not measured in the experiments. A limited load region is one of the main problems of homogeneous charge compression ignition. In the work reported in this paper the autoignition (AI) load region specific to a small two-stroke engine has been investigated. The objective was to gain a better understanding regarding the characteristics of the AI operating regime by studying the combustion stability and exhaust emissions. AI combustion was achieved by trapping hot exhaust gases inside the cylinder with an exhaust throttle valve. The intake throttle, exhaust throttle, and fuelling rate were manually adjusted to obtain the required engine operating points. The nature of combustion and implications of exhaust emissions have been discussed in relation to the load regions of AI operation. The operation of AI in the medium- to high-load ranges demonstrated a higher degree of cyclic stability. In contrast with this, AI operation at lower-loads demonstrated a higher degree of cyclic instability. This paper aims to understand how a micro synthetic jet actuator works effectively to prevent the boundary layer flow from laminar separation caused by adverse pressure gradient. Experimental results showed that syntheticjets were effective when the forcing frequency was a lower frequency of the Tollmien-Schlichting (T-S) wave, which received amplification from the base flow. They demonstrated the feasibility of controlling a largescale structure feature, such as flow separation, using a micro actuator which requires very low power supply 7.5 V) and generates inaudible noise in a boundary layer with the Reynolds number of 1.78 x 10(5)-2.24 x 10(5). The interaction between the synthetic jet and the base flow is analyzed, and the significance of using the instability to make the synthetic jets effective is discussed. To enable a micro actuator to work effectively on preventing the boundary layer flow from laminar separation, the key issue is to use the synthetic jet actuator as an instability trigger to trigger T-S instability which resonates with the Kelvin-Helmortz (K-H) instability to accelerate the viscous transition. The triggered T-S waves are amplified and enhanced by the non-viscous K-H instability of the base flow and consequently become effective in controlling the K-H instability. As a trigger rather than a force generator, the synthetic jet actuator actuates independently to its size and weight. Hong, G., Mack, A.N., Menolotto, F., Jamieson, C.S. & Main, S.G. 2005, 'Numerical Visualization of air short-circuiting in a small two-stroke SI engine', SAE 2004 Transactions Journal of Engineers, vol. 113, no. 3, pp. 1760-1765. The synthetic jet actuator (SJA) is a low power, highly compact microfluidic device which has potential application in boundary layer flow control. In recent work we have shown how synthetic jets work without cross flow and how effectively they modify the flow structure in the boundary layer under an adverse pressure gradient. This paper describes the piezoelectric synthetic jet actuator used in our experiments. The experimental set-up for flow control using this type of actuator is detailed. The results obtained show a significant enhancement of the jet effectiveness by forcing the boundary layer flow at the natural instability frequency. The actuators must have sufficient velocity output to produce strong enough vortices if they are to be effective for flow control. The forcing effect can occur at a frequency lower than the driving frequency of the actuator when used without cross flow. The forcing frequency appears to be an important parameter in synthetic jet boundary layer flow control. This paper reports work on modelling the exhaust noise pressure of a small single-cylinder spark ignition (SI) engine. The model will ultimately be used for on-line prediction of exhaust noise in an active control system with a single-error microphone. The frequency properties of the engine exhaust noise generated by this SI engine are characterized by harmonic components related to engine firing conditions. The frequencies of the harmonic components depend only on the engine firing frequency while the amplitudes of the harmonic components vary with the engine load. Twenty harmonic components at the lower frequency band were included to model the exhaust pressure pulse which is a two-dimensional function of engine speed and load. The model is represented by a double Chebyshev polynomial. The instantaneous exhaust pressure at steady state for a fixed position in the exhaust pipe was predicted using this model and compared with the experimental data. The result of this comparison is regarded as satisfactory. © IMechE 1999. Gostelow, JP, Walker, GJ, Solomon, W, Hong, G & Melwani, N 1997, 'Investigation Of The Calmed Region Behind A Turbulent Spot', Journal Of Turbomachinery-transactions Of The Asme, vol. 119, no. 4, pp. 802-809. This paper addresses the large-scale structure identification of an artificially generated turbulent spot that simulates the spontaneous turbulent intermittency in a Blasius boundary layer. The Blasius velocity profile of the laminar boundary layer was taken as a reference to observe the turbulent spot. This differs from the conventional method that takes the wall as a reference. The structure of the spot was identified with the profile of the velocity perturbation that is the deviation of the ensemble-averaged velocity of the interior spot from the velocity of the unperturbed laminar flow surrounding the spot. The velocity perturbations near the central streamline on a y-t plane are taken as a sample to describe the identification method. The identified large-scale structure of the spot is a spanwise vortex moving downstream (forward) and rolling backward in the laminar boundary layer. The streamwise velocity perturbation of the turbulent spot from the experiments is compared with the horizontal velocity component of a vortex numerically generated by a CFD code in order to verify the number of vortices contained in a turbulent spot. Significance of the large-scale structure of turbulent spots is analyzed. The role of turbulent spots under zero and adverse pressure gradients is discussed briefly. Copyright © 1996 by Begell House. Inc. In this work a novel methodology for the estimation of convective heat transfer coefficients is presented. The convective heat transfer coefficients are estimated using novel and existing time series methods, and are compared with those obtained from the standard 'ratio of means' approach, and those given in the CIBSE Guide. The time series methods are used to estimate an impulse response function of the heat flux at the surface to the temperature difference through the air boundary layer to the bulk air within the enclosure. The impulse response function displays the time-delayed response of the surface heat flux to the air-surface temperature difference, and thus indicates the speed of the process. The area under the estimated response function yields the 'gain' between the surface heat flux and the air-surface temperature difference, or the convective heat transfer coefficient. This methodology is employed to estimate the convective heat transfer coefficient of the ceiling within an experimental building, in a convective heating environment. The variation of the convective heat transfer coefficient across the boundary layer is shown, from which the thickness of the boundary layer is estimated. A methodology for the estimation of the hourly variation of the convective heat transfer coefficient is also presented, and is employed to investigate the time varying nature of the convective heat transfer coefficient. © 1993. Response factors of physical processes offer an accurate way to characterize the performance of building components. In this work a new methodology for estimating response factors; this methodology is based on time series analysis techniques. In this work a new time series method of estimating the response factor values is applied to data collected from a passive solar test cell. The response factors of the test cell to the radiation component of the energy budget during the day time and the night time were estimated. From these response factors the night time long wave loss, the day time short-wave gain at the external and internal surface of the north wall of the test cell are evaluated and discussed. Specific short periods of data were selected so that values at the meteorological extremes could be estimated. These values help the designer to identify the appropriate range of performance characteristics of the building under study. The effects of infiltration rate on the estimated long wave loss and short-wave gain are also presented and discussed. This work is part of a broader study that is examining aspects of response factor estimation and its application to the performance assessment in the building environment. © 1993. Turbulent spots were generated artificially to simulate natural spots in the transitional boundary layer. The spots at the final stage under zero and adverse pressure gradients were measured using conventional hotwire anemometry technique. Ensemble averages of the velocity traces were calculated and velocity profiles through the spots and the surrounding region were plotted. The spots are represented by the ensemble average of the velocity perturbations. The integral boundary layer properties are derived and compared through the spots. The effect of the pressure gradient on the turbulent spots is analysed with the structure of the spots and the 'calmed region' following the spots. The information acquired from spot measurement should improve the understanding of the physical properties of the turbulence spots and therefore the modelling of the transitional boundary layer. © 1992 Science Press. lubricants in IC engines and batteries in hybrid vehicles. chemical material to reach the reaction temperature. © 2018 SAE International. All Rights Reserved. Since 1st September 2014 the Hong Kong Environmental Protection Department (HKEPD) has been utilising a Dual Remote Sensing technique to monitor the emissions from gasoline and liquified petroleum gas (LPG) vehicles for identifying high emitting vehicles running on road. Remote sensing measures and determines volume ratios of the emission gases of HC, CO and NO against CO2, which are used for determining if a vehicle is a high emitter. Characterisation of each emission gas is shown and its potential to identify a high emitter is established. The data covers a total of about 2,200,000 LPG vehicle emission measurements taken from 14 different remote sensing units. It was collected from 6th January 2012 to 20th April 2017 across a period before and after the launch of the Remote Sensing programme for evaluating the performance of the programme. The results show that the HKEPD Remote Sensing programme is very effective to detect high emitting vehicles and reduce on-road vehicle emissions. The average measured remote sensing emissions of HC, CO and NO reduced by 53.6%, 29.6% and 50.3% respectively from 2013 (the year before the launch of the programme) to 2015 (the year after the launch of the programme). © 2018 SAE International. All Rights Reserved. Vehicle emissions and fuel consumption are significantly affected by driving behavior. Many studies of eco-driving technology such as eco-driving training, driving simulators and on-board eco-driving devices have reported potential reductions in emissions and fuel consumption. Use of on-board safety devices is mainly for safety, but also affects vehicle emissions and fuel consumption. In this study, an on-board safety device was installed to alert the driver and provide several types of warning to the driver (e.g. headway monitoring warning, lane collision warning, speed limit warning, etc.) to improve driving behavior. A portable emissions measurement system (PEMS) was used to measure vehicle exhaust concentrations, including hydrocarbons (HC), carbon monoxide (CO), carbon dioxide (CO2) and nitrogen oxides (NOx). The driving parameters including vehicle speed, acceleration and position were also recorded. A specific test route was designed for the experiment to investigate both urban and highway conditions. The driving parameters and emissions data were compared before and after the installation of the on-board safety device with the same driver. The Vehicle Specific Power (VSP) methodology was applied to evaluate the effects of the on-board safety device on driving behavior. The results indicated that the device had a positive effect on the driver's driving behavior. The percentage of time spent on excessive speeding and strong acceleration decreased from 22.2% to 14.7%. As a result, an average reduction of 25% in fuel consumption was observed. In addition, HC, CO2 and NOx emissions showed a reduction of 57%, 25% and 9% respectively. However, CO emission was increased and the time spent on idling showed no change with the installation of the device. the advanced direct injection timing. Ethanol fuel, as a bioproduct with greater octane number, combustion speed and latent heat of vaporization, has become a common choice as an additive and/or an alternative option to gasoline fuel in the spark ignition engines. In order to fully utilize ethanol fuel properties to improve engine performance, a new injection strategy, ethanol port injection plus ethanol direct injection (EDI), has been in development. Work reported in this paper aimed to investigate, experimentally, the effect of ethanol fuel and dual ethanol injection strategy on engine performance, combustion and emissions characteristics at two engine loads and optimized spark timing. The results of both engine loads, light and medium, demonstrated that the indicated mean effective pressure (IMEP) was significantly improved over all dual ethanol injection strategy compared to GPI. The maximum improvement was 3.3485% and 4.357% at light and medium engine loads respectively. The improvement was mainly due to the reduced combustion duration (10-90%) which was reduced by 8.15CAD at light load and 4.28CAD at medium load compared to GPI. However, at higher EDI percentages, the over cooling effect and poor mixture quality adversely affected the combustion quality. The indicated specific nitric oxide emission was considerably reduced, at 100% of EDI, by up to 55.1% and 58.46% at light and medium loads respectively. Nevertheless, because of poor mixture quality and high wall wetting, the indicated specific hydrocarbon and the indicated specific carbon monoxide were raised with the increase of EDI percentage. Regarding the effect of spark timing, the dual ethanol injection strategy improved the IMEP significantly at the maximum IMEP spark timing. The indirect evaporative cooling system and heat recovery system utilize the return (secondary) air to condition the fresh (primary) air by means of air-to-air heat exchange between the two streams. The temperature difference between the primary and secondary air streams in indirect evaporative cooling system is relatively small. Therefore, efficient heat exchangers should be used since they play a major role in the overall system performance and economics. The parallel plate type heat exchangers have been widely adopted in Indirect Evaporative Cooling (IEC) systems due to their high efficiency in operating at small temperature difference. In this paper we present a theoretical analysis of different designs of counter flow aluminium plate type heat exchanger and results of CFD analysis of pressure drop, flow velocity and thermal effectiveness. For improving the heat transfer between the plates and minimizing the energy loss, the analysis proves useful in the optimization method for selecting parameters of the plate heat exchangers. Molecular motion is often at the heart of heat transfer. Molecular dynamic (MD) modelling is becoming a valuable tool in both gaining an understanding of heat transfer processes and in evaluating heat transfer situations. This paper presents some simple models employing MD simulations based on Newtonian mechanics that show potential in the teaching of heat transfer at the conceptual level and that introduce engineers and scientists to the relatively new tool of Molecular Dynamic Simulation. Ethanol direct injection plus gasoline port injection (EDI+GPI) represents a more efficient and flexible way to utilize ethanol fuel in spark ignition (SI) engines. The greater cooling effect and higher octane number of ethanol fuel make it possible to implement engine downsizing while avoiding knock in SI engines. In this paper, experiments were conducted on a single-cylinder 0.25L-displacement SI engine equipped with an EDI+GPI dual-injection fuel system. The engine was run at medium load (IMEP 6.3-7.0 bar) and stoichiometric fuel/air ratio. The ethanol ratio by volume varied from 0% (GPI only) to 100% (EDI only). Experimental results showed that the IMEP and thermal efficiency increased with the increase of ethanol ratio up to an ethanol ratio of 69% at 3500 RPM and 76% at 4000 RPM. With ethanol ratio greater than 69% or 76%, the IMEP and thermal efficiency reduced with the increased ethanol ratio. For engine exhaust gas emissions, the CO and HC emissions increased and NO decreased with the increase of ethanol ratio from 0% to 100%. decreased significantly and ISNO increased moderately with the increase ethanol fuel temperature. direct injection (EDI), GPI plus gasoline direct injection (GDI) and GPI only, on the engine performance and the emissions. 76% to gasoline, the combustion becomes more unstable and more CO and HC emitted than that in GPI only. The work reported in this paper contributes to understanding the effects of ethanol/gasoline ratio on mixture formation and cooling effect which are crucial in the development of EDI+GPI engine. The spray simulations were carried out using a commercial CFD code. The model was verified by comparing the numerical and experimental results of spray shapes in a constant volume chamber and cylinder pressure in an EDI+GPI research engine. The verified model was used to investigate the fuel vaporization and mixture formation of the EDI+GPI research engine. The effect of the ethanol/gasoline ratio on charge cooling has been studied. Compared with GPI only, EDI+GPI demonstrated stronger effect on charge cooling by decreased in-cylinder temperature. However, the cooling effect was limited by the low evaporation rate of the ethanol fuel due to its lower saturation vapour pressure than gasoline's in low temperature conditions. The cooling effect of EDI increased with the increase of ethanol/gasoline ratio until the ratio reached 58% (by volume). Further increase of ethanol/gasoline ratio did not improve the cooling effect, but left more liquid ethanol droplets in the combustion chamber by the time of spark. This could lead to incomplete combustion and explained the increased CO and HC emissions with the increase of ethanol content as reported in the experiments. The cooling potential and the completeness of ethanol evaporation were two completing factors that determine the final cooling effect of EDI. This implied the existence of ethanol/gasoline ratio 40-50% which can optimize the cooling effect and combustion performance. This paper reports the development of a CFD model for investigating the ethanol direct injection plus gasoline port injection (EDI+GPI) engine. The model was developed using the commercial CFD code ANSYS FLUENT as a solver. The computational domain was meshed based on the scanned geometry of the cylinder head. Realizable k- turbulence model was used to simulate the in-cylinder flows. The Eulerian-Lagrangian approach was used to model the evolution of the fuel sprays. The dual-fuel combustion process was modelled by the Extended Coherent Flame Model (ECFM) in the partially premixed combustion concept. A five-dimensional presumed Probability Density Function (PDF) look-up table was used to model the dual-fuel turbulence-chemistry interactions. The model was verified by the good agreement between the numerical and experimental results of spray shapes in a constant volume chamber and cylinder pressure on the EDI+GPI research engine. Sample simulation results showed that the model was capable to simulate the spray combustion process of the EDI+GPI engine and meet the needs of the investigation. This paper reports the macroscopic and microscopic characteristics of ethanol and gasoline direct injection sprays from a multi-hole injector. The spray experiments were conducted in a constant volume chamber in atmospheric condition (1 bar and 300 K ambient condition). Compressed nitrogen was used to pressurize the injection pressure which was 6.0 MPa. The injection pulse width was 2.0 ms. The high speed Shadowgraphy imaging technique with a speed of 20000 fps @ 608×288 pixels was used to capture the macroscopic spray characteristics. Based on that, the high magnification imaging of the ethanol and gasoline sprays close to the nozzle exit was conducted with the same flash and camera but with an AFTVision ZL0911 microscope. In order to capture the first fuel seen from the nozzle exit, the camera speed was increased to 50000 fps @ 240×88 pixels. Results showed that the macroscopic characteristics of ethanol and gasoline sprays were rather similar in terms of spray tip penetration, spray angle and spray projected area in spite of the differences in physical properties. However, the magnified spray images at the nozzle exit showed that ethanol spray had a larger and sheet-like ligaments at the end of injection than gasoline spray did due to ethanol's larger surface tension and viscosity. It may imply that the fuel properties only have significant effect on the spray during the primary breakup process, but not on the secondary breakup process. Motor vehicles rate models for predicting emissions of oxides of nitrogen (NOX) are insensitive to their modes of operation such as cruise, acceleration, deceleration and idle, because these models are usually based on the average trip speed. This study demonstrates the feasibility of using other variables such as vehicle speed, acceleration, load, power and ambient temperature to predict NOX emissions. The NOX emissions need to be accurately estimated to ensure that air quality plans are designed and implemented appropriately. For this, we propose to use the non-parametric multivariate adaptive regression splines (MARS) to model NOX emission of vehicle in accordance with on-board measurements and also the chassis dynamometer testing. The MARS methodology is then applied to estimate the NOX emissions. The model approach provides more reliable results of the estimation and offers better predictions of NOX emissions. The results therefore suggest that the MARS methodology is a useful and fairly accurate tool for predicting NOX emission that may be adopted by regulatory agencies in understanding the effect of vehicle operation and NOX emissions. Ethanol direct injection plus gasoline port injection (EDI+GPI) is a new technology to make the use of ethanol fuel more effective and efficient in spark ignition engines. It takes the advantages of ethanol fuel, such as its greater latent heat of vaporization than that of gasoline fuel, to enhance the charge cooling effect and consequently to increase the compression ratio and improve the engine thermal efficiency. Experimental investigation has shown improvement in the performance of a single cylinder spark ignition engine equipped with EDI+GPI. It was inferred that the charge cooling enhanced by EDI played an important role. To investigate it, a CFD model has been developed for the experimentally tested engine. The Eulerian-Lagrangian approach and Discrete Droplet Model were used to model the evolution of the fuel sprays. The model was verified by comparing the numerical and experimental results of cylinder pressure during the intake and compression strokes. Mesh density and time step sensitivities have been tested. The verified model was used to investigate the charge cooling effect of EDI in terms of spatial and temporal distributions of cylinder temperature and fuel vapor fraction. Compared with GPI only, EDI+GPI demonstrated stronger effect on charge cooling by decreased in-cylinder temperature. The cooling effect was limited by the low evaporation rate of the ethanol fuel due to its lower saturation vapor pressure than gasoline's in low temperature conditions. Premixed charge compression ignition (PCCI) is a new combustion mode to reduce NOX and soot emission. It requires the optimization of the injection timing and pressure, fuel mass in pilot injection and EGR rate. A 6-cylinder, turbocharged, common rail heavy-duty diesel engine was used in this study. The effect of multiple injection strategies on diesel fuel combustion process, heat release rate, emission and economy of diesel engine is studied. The multiple injection strategies include different EGR level, pilot injection timing, pilot injection mass and post injection timing to achieve the homogeneous compression ignition and lower temperature combustion of diesel engine. Based on endoscope technology, the two-color method was applied to take the flame images in the engine cylinder and obtain soot concentration distribution, to understand the PCCI combustion in diesel engines. The results demonstrate that when EGR level is increased, the intensity of the premixed combustion becomes lower, and the ignition timing of the main combustion process is delayed. With increased EGR, the NOX emission is decreased significantly, but soot, HC and CO emissions are increased. With the advance of pilot injection timing, the peak in-cylinder pressure becomes lower, the ignition delay of the main combustion is shortened, the NOX and soot emissions are reduced, but the HC and CO emissions are increased. With the increase of pilot injection fuel mass, the heat release rate of the pilot injection combustion and the maximum rate of pressure rise increase, NOX and HC emissions are higher, and PM and CO emissions are reduced. The pilot combustion flame is non-luminous. Retarding the post injection timing results in negligible change in the cylinder pressure and peak rate of main heat release, but reduction in NOX emission, and the soot emission firstly increased and then decreased. Ethanol has been used as a renewable fuel in internal combustion (IC) engines. However, the existing method of blending gasoline and ethanol fuels does not take the advantages of ethanol fuel, such as its high Octane number and great latent heat of vaporization, to increase the engine compression ratio and consequently the thermal efficiency. Ethanol direct injection plus gasoline port injection (EDI+GPI) is a new technology for using ethanol fuel more effectively and efficiently in IC engine. To experimentally investigate this new technique, a research engine has been developed by modifying a commercial product representing the cylinder capacity of a down sized passenger car engine. In the development of this research engine, two major tasks were addressed: the two separate fuel systems and the electronic control unit (ECU). The operation of both fuel systems including the high pressure pump and the common rail fuel pressure are electronically controlled. The ECU also controls the throttle position and fuel flow rates in an open loop to provide the flexibility of manual adjustments of engine speed, load and lambda. Sample results are reported to show that the developed engine system has met the basic requirements of experiments in this investigation. Ethanol fuel, as a renewable fuel can play an important role in addressing the critical issue of energy resources if it is used in a proper way. Ethanol direct injection plus gasoline port injection (EDI+GPI) is such a new way to enable substantial improvement in engine efficiency and emission reduction in spark ignition engines. This paper reports our preliminary investigation to the combustion and emissions in this new dual fuel injection system. Experiments were conducted on a single-cylinder spark ignition engine equipped with EDI+GPI. In the experiments, the ethanol/gasoline volumetric percentage (EVP) was varied from 0% (gasoline fuel only) to 71%. Mass burnt fraction and indicated mean effective pressure (IMEP) were calculated from the measured cylinder pressure for analysing the combustion process. The variance of IMEP, reduced with the increased EVP, showed that the combustion stability was improved by the direct injection of ethanol fuel. The effect of EVP on initial, early and major combustion time periods showed that ethanol fuelâs higher combustion velocity and low ignition energy might contribute to accelerating the flame propagating, shortening the combustion periods and reducing the combustion temperature when EVP was less than 48%. However further increase of EVP when it was over 48% resulted in a negative effect on combustion which might be caused by the ethanol fuelâs over cooling effect. Hydrocarbon and carbon monoxide emission increased and nitric oxide emission decreased with the increase of EVP. Hong, G 2010, 'The influence of forcing frequency and amplitude to effectiveness of synthetic jets on laminar separation control', 17th Australasian Fluid Mechanics Conference 2010, pp. 71-74. A synthetic jet actuator (SJA) is regarded to be effective if the separating bubble is eliminated in the control of boundary layer separation. One novel idea is to use the flow instability as internal energy to enhance the effectiveness of synthetic jets. To explore this idea, a three-dimensional large eddy simulation (LES) was performed and the influence of forcing frequency and amplitude to the SJA's effectiveness was investigated. The numerical model was verified by experimental results in a laminar separation zone in a boundary layer with adverse pressure gradient. The numerical results of the SJA's effectiveness were compared to identify the significance in changes made by varied forcing frequency at fixed forcing amplitude and by varied forcing amplitude at a fixed forcing frequency. Consistent with the wind tunnel experiments, LES results showed that the effectiveness of the SJA depends more on the forcing frequency than on the forcing amplitude. They support the inference from the experiments that the non-frictional Kelvin-Helmholtz (K-H) instability associated with the laminar separation is a source for enhancing the frictional Tollmien-Schlichting (T-S) instability which resists the laminar separation. Gibbes, G & Hong, G 2010, 'Improving the accuracy of a 1D gas dynamics model', 17th Australasian Fluid Mechanics Conference 2010, pp. 783-786. This paper and its companion present the salient features of a 1D gas dynamics code which traces the propagation of finite amplitude waves along a quasi 1D duct. This model extends an originally first order method to second order, and re-works the way heat transfer is accounted for, including a method for maintaining full mass conservation. The model is fully non-homentropic, accounting for the large variations in gas properties and temperature that routinely occur in internal combustion engine ducts. In this paper, the model is tested against three basic problems for constant-area frictionless flow - namely propagation of a small short wavelength pulse to test numerical smearing, the shock tube problem to test handling of steep gradients, and the Rayleigh flow problem to test the heat transfer implementation. The tests show the model performs very well in these simple cases which are a pre-requisite to more complex modeling tasks. This mode offers a useful alternative to finite difference based codes and addresses the criticisms usually made of wave action methods. It allows a uniform treatment of duct and cell boundaries to be used throughout. Gibbes, G & Hong, G 2010, 'A general boundary solution method for 1D gas dynamic models', 17th Australasian Fluid Mechanics Conference 2010, pp. 787-790. This paper outlines a generalised boundary solution method for solving flow at boundaries of 1D duct models. It is adaptable to duct-duct connections and duct-volume connections with subsonic, choked and supersonic flows. It is fully non-homentropic (accounting for friction, and temperature and property variations). The generalised approach aids in reducing code complexity for the approximately 30 distinct flow types that can exist at the boundaries of 1D ducts. Assumptions are described and numerical methods outlined. The solution requires solution of a number of non-linear simultaneous equations which is accomplished with the Newton-Raphson method. Sample results for a converging flow compared to experimental date are given. This paper and its companion present the salient features of a ID gas dynamics code which traces the propagation of finite amplitude waves along a quasi I D duct. This model extends an originally first order method to second order, and re-works the way heat transfer is accounted for, including a method for maintaining full mass conservation. The model is fully nonhomentropic, accounting for the large variations in gas properties and temperature that routinely occur in internal combustion engine ducts. In this paper, the model is tested against three basic problems for constant-area fi'ictionless flow - namely propagation of a small short wavelength pulse to test numerical smearing, the shock tube problem to test handling of steep gradients, and the Rayleigh flow problem to test the heat transfer implementation. The tests show the model performs very well in these simple cases which are a pre-requisite to more complex modeling tasks. This mode offers a useful alternative to finite difference based codes and addresses the criticisms usually made of wave action methods. It allows a uniform treatment of duct and cell boundaries to be used throughout. This paper outlines a generalised boundary solution method for solving flow at boundaries of ID duct models. It is adaptable to duct-duct connections and duct-volume connections with subsonic, choked and supersonic flows. It is fully nonhomentropic (accounting for friction, and temperature and property variations). The generalised approach aids in reducing code complexity for the approximately 30 distinct flow types that can exist at the boundaries of I D ducts. Assumptions are described and numerical methods outlined. The so lution requires solution of a number of non-linear simultaneous equations which is accomplished with the Newton-Raphson method. Sample results for a converging flow compared to experimental date are given. Tsang, P. & Hong, G. 2009, 'A Synthetic Jet Evolving In A Boundary Layer With Laminar Separation', Proceedings of the 7th Pacific Symposium on Flow Visualization and Image Processing, Pacific Symposium on Flow Visualization and Image Processing, National Pingtung University of Science & Technology, Kaohsiung, Taiwan, pp. 1-6. This paper reports our work on numerical modeling of a micro synthetic jet in a boundary layer with separating flow caused by adverse pressure gradient. The numerical model was developed using a commercial code with threedimensional Large Eddy Simulation (LES) applied. The model was verified by experimental results. The numerical results enabled flow visualization which helped us understand the evolution of a synthetic jet between the synthetic jet actuator (SJA) and the onset of separation, which was not measured in experiments. Cyclic instability is a common problem in the operation of conventional two-stroke spark-ignition engines. Previous research has shown that auto-ignition (AI) could help solve this problem. However, at light engine loads, even under AI, the cyclic instability may still be significant due to the difficulty in maintaining the minimum temperature required by AI. Despite the benefits brought by AI in fuel consumption and emission reduction, the high level of cycle-to-cycle variation at light load may delay the realization of AI operation in engine products. To solve this problem, spark assistance has been identified as a cost effective and convenient way to improve the stability of AI operation at light load. This paper aims to report our experimental investigation to the effectiveness of spark assistance on cyclic variation of AI at light engine load conditions. Computational Fluid Dynamics (CFD) offers an alternative technique to understand the in-cylinder gas behaviour of an internal combustion engine. In our experimental investigations, auto-ignition (AI) was achieved in a small two-stroke engine by internal exhaust gas recirculation (EGR) using an exhaust port valve to trap the burnt gas. A CFD model was developed, aiming to study the temperature and the distribution of the trapped burned gas prior to AI. The engine to be modelled was a 160cc single-cylinder piston ported two-stroke engine equipped with a butterfly valve in the exhaust pipe. The CFD model was developed using a commercial code. The turbulence model was RNG k-e. Experimental data were used to define the initial and boundary conditions. The model simulates the gas exchange process from the exhaust port opening to the point before the ignition. It was verified by comparing the numerical result of cylinder pressure with the experimental one. Then the verified numerical model was used to perform numerical simulations of the gas exchange process at various engine operating conditions. The effect of the exhaust port restriction, the intake valve opening and the engine speed on the temperature and the distribution of trapped burnt gas in cylinder were analysed. The simulation results suggested that the exhaust valve restriction had a stronger effect than the intake valve did. The numerical results for investigating the effect of the engine speed helped understand the AI operation region investigated in the experiments. Watson, F. & Hong, G. 2007, 'Application of Exhaust Pipe Restriction Technique to a Small Two-Stroke Engine', Proceedings, 13th Small Engine Technology Conference, 13th Small Engine Technology Conference, SOciety of Automotive Engineers of Japan, Inc and SAE International, Toki Messe, Niigata Convention Center, Niigata, Japan, pp. 1-6. Wijesinghe, J.S. & Hong, G. 2007, 'Using auto-ignition to improve the cycle-to-cycle variations of a small two-stroke engine', Proceedings, the 13th Small Engine Technology Conference, 13th Small Engine Technology Conference, Society of Automotive Engineers of Japan, Inc and SAE International, Toki Messe, Niigata Convention Center, Niigata, Japan, pp. 1-6. Small Engine Technology Conference (SETC) is a yearly conference organized by the Society of Automotive Engineers of Japan and SAE International (US based). Each paper published has two series numbers. The series numbers for this paper are SAE 2007-32-0040 and JSAE 20076540. The proceedings is published in a CD. Gibbes, G.P. & Hong, G. 2007, 'Numerically Modeling the Dynamics of a Piston-Mounted Passive Inlet Poppet Valve', Proceedings of the 13th Small Engine Technology Conference, 13th Small Engine Technology Conference, Society of Automotive Engineers of Japan, Inc. and SAE International, Toki Messe, Niigata Convention Center, Niigata, Japan, pp. 1-7. Small Engine Technology Conference (SETC) is a yearly conference organized by the Society of Automotive Engineers of Japan and SAE International (US based). Each paper published has two series numbers. The series numbers for this paper are SAE 2007-32-0040 and JSAE 20076540. The proceedings is published in a CD which is available for review. Lesbros, S, Ozawa, T & Hong, G 2006, 'Numerical modeling of synthetic jets with cross flow in a boundary layer at an adverse pressure gradient', Collection of Technical Papers - 3rd AIAA Flow Control Conference, pp. 1649-1658. This paper reports preliminary results of simulating a synthetic jet interacting with the boundary layer flow in laminar separation. The numerical model development aimed to simulate the physical process in previous experimental investigation. A model for simulating the base flow was developed first and then extended to including the synthetic jet. The computational domain was three-dimensional and covered the exit of the synthetic jet actuator and the separation region. Large-eddy simulation (LES) was employed, and the initial and boundary conditions were defined using or referring to wind tunnel experimental results. The numerical model was verified by comparing the simulation with experimental results. Based on reasonable agreement between the numerical and experimental results, simulations were carried out to investigate the dependency of the synthetic jet's actuation on the forcing frequency, in a focused range of the lower Tollmien-Schlichting (T-S) frequencies. Hong, G. & Ozawa, T. 2005, 'The Role of Synthetic Jets in Resisting Flow Separation in Boundary Layer under Adverse Pressure Gradient', Proceedings of The Eighth International Symposium on Fluid Control, Measurement and Visualization, The Eighth International Symposium on Fluid Control, Measurement and Visualization, China Aerodynamics Research Society, Chengdu, China, pp. 15-22. Ho, M.K., Hong, G., Yeoh, G. & Wassink, D. 2005, 'Experimental Investigation of Flow-Induced Vibration in a Parallel Plate Reactor Fuel Assembly', Eleventh International Topical Meeting on Nuclear Reactor Thermal Hadraulics, Eleventh International Topical Meeting on Nuclear Reactor Thermal Hadraulics, NURETH 11, Avignon, France, pp. 1-10. When synthetic jet actuators are used to control flow separation in practical situations, it is anticipated that the orifices will be distributed in the form of an array. Wind tunnel experiments were conducted to investigate the effect of the location and number of these actuators on boundary layer separation. Three synthetic jets were located upstream of the separation point in undisturbed flow, and the mean and root mean-square (RMS) velocity profiles were measured at several axial locations within the separated flow region. This paper reports the effect of actuator placement and the integrated effectiveness of two and three synthetic jets with different forcing voltages and frequencies. The flow produced by a synthetic jet actuator located in one wall of a microchannel is investigated using computational fluid dynamics (CFD) simulations. In the case of no cross-flow, the ejected vortices travel to the opposite wall and replenish the remains of the vortex left behind from the previous cycle. When cross-flow is added, the vortex penetration increases with both stroke length and frequency. The flow in the cavity appears to be nearly symmetrical, with the greatest effect seen near the orifice. In the orifice itself, three-dimensional effects are more noticeable with decreasing jet-to-cross-flow momentum ratio. The microchannel cross-flow causes the vortices to tumble about their transverse axis, the effect of which also increases with decreasing jet-to-cross-flow momentum ratio. Hong, G, Lee, C, Ha, QP, Mack, AN & Mallinson, SG 2002, 'Effectiveness of synthetic jets enhanced by instability of Tollmien-Schlichting waves', AIAA 1st Flow Control Conference, AIAA 1st Flow Control Conference, American Institute of Aeronautics and Astronautics, St. Louis, Missouri, pp. 1-6. Lee, C., Hong, G., Ha, Q.P. & Mallinson, S.G. 2002, 'Synthetic jet generator- a micro actuator for air flow control', Proc. of the Pacific Rim workshop on Transducers and Micro/Nano Technologies, Proc. of the Pacific Rim workshop on Transducers and Micro/Nano Technologies, Xiamen China, pp. 339-342. Shijie, W & Hong, G 2001, 'Theoretical Analysis of the Strength of Internal Gear Drive with Zero-tooth-difference', ASME International Mechanical Engineering Congress and Exposition, Proceedings, pp. 893-898. In this paper we apply internal gear drive pair, with zero-tooth-difference, in the coupling mechanism to connect the output shaft of reducer and the rotor of pump in the submerged-motor-driven PC pumping system for oil production. Because there are dual modifications along radial and tangential direction for the cut of gear teeth, the gear-tooth thickness will be reduced and thus the strength of the teeth will be weakened evidently. At present, there is no theoretical criteria for the strength verification suitable for such mechanism design. The new calculating formulae for contacting stress of tooth surface and bending stress of tooth-root were established in this paper just for this reason, which not only provide the strength verifying criteria for gear-tooth but can also be regarded as the theoretical basis for the design of internal gear drive mechanism with zero-tooth-difference. Lee, C., Mallinson, S.G. & Hong, G. 2001, 'Synthetic jet / boundary layer interaction', Proceedings, ASME Sixth International Thermal Anemometry Symposium, American Society of Mechanical Engineers, Melbourne, Australia. Mallinson, S.G., Hong, G., Reizes, J. & Westbury, P.S. 2001, 'Analysis of hot-wire anemometry data obtained in a synthetic jet flow', Proceedings, ASME Sixth International Thermal Anemometry Symposium, ASME Sixth International Thermal Anemometry Symposium, American Society of Mechanical Engineers, Melbourne, Australia. Wang, S & Hong, G 2001, 'Innovative design of a thrust-eccentric gear coupling for submerged-motor-driven PC pumping system', 2001 Proceedings, ASME DESIGN ENGINEERING TECH CONFERENCES AND COMPUTERS AND INFORMATION IN ENGINEERING CONFERENCE, ASME DESIGN ENGINEERING TECH CONFERENCES AND COMPUTERS AND INFORMATION IN ENGINEERING CONFERENCE, American Society of Mechanical Engineers (ASME), Pittsburgh, PA, U.S.A, pp. 1193-1198. Wang, S & Hong, G 2001, 'Theoretical analysis of the strength of internal gear drive with zero-tooth-difference', Proceedings, 2001 ASME International Mechanical Engineering Congress and Exposition, ASME International Mechanical Engineering Congress and Exposition, American Society of Mechanical Engineers, New York. Hong, G., Mallinson, S.G. & Reizes, J. 2000, 'Experimental and numerical visualization of synthetic jets', Proceedings, 9th Millennium International Symposium on Flow Visualization, Millennium International Symposium on Flow Visualization, Heriot-Watt University, Edinburgh, Edinburgh, UK. Horrocks, G., Reizes, J. & Hong, G. 2000, 'Tumble vortex breakdown during the compression stroke of a model internal combustion engines', 2000 Fall Technical Conference of the ASME International Combustion Engine Division Peoria IL, The American Society of Mechanical Engineers, Peoria IL, pp. 39-52. Mallinson, SG, Reizes, J, Hong, G & Haga, H 2000, 'The operation and application of synthetic jets actuators', 31st AIAA Fluids 2000 Conference, AIAA Fluids 2000 Conference, American Institute of Aeronautics and Astronautics, Denver, CO, USA. Mallinson, S.G., Hong, G. & Reizes, J. 2000, 'Experimental studies of a zero mass-flux flow control actuator', Proceedings of the 5th International Conference on Motion and Vibration Control, International Conference on Motion and Vibration Control, Sydney, Australia, pp. 921-926. Mallinson, SG, Reizes, JA, Hong, G & Buttini, M 1999, 'Synthetic jet actuators for flow control', Proceedings of SPIE - The International Society for Optical Engineering, pp. 146-156. The synthetic jet actuator is a novel means of applying flow control that lends itself to incorporation into micro-electro-mechanical systems. Experimental and computational studies of the flow generated by this actuator are presented and discussed. The synthetic jet is seen to resemble a steady turbulent jet. Self-similarity is, however, achieved closer to the orifice in the case of the synthetic jet, and this is consistent with the observation from the numerical simulations that a main vortex is trapped close to the orifice. This main vortex merges with the secondary vortex that is generated at the circumference of the orifice during each cycle of oscillation of the actuator membrane. The effect of synthetic jets on wake flows and flames has also been examined. Preliminary results of these investigations suggest that synthetic jets can significantly reduce drag and enhance mixing. A natural gas engine based on the principle of a long stroke reciprocating mechanism (LSRM) is proposed. The crankshaft arrangement in a conventional internal combustion (IC) engine will be replaced by a LSRM featuring long stroke and low speed. A major advantage of this LSRM system is that it considerably reduces the side force, which is inherent in conventional crankshaft arrangements. Another advantage is that the LSRM engine will be more compact than an equivalent crank engine operating under the same conditions of speed, power output and so on. The reduced size and complexity of the engine lead to a favorable reduction in manufacturing and, more importantly, maintenance costs. Using gas fuel will allow an increased compression ratio, which is usually limited by the operating nature of the Otto cycle in gasoline engines. With a longer stroke length and lower engine speed, the engine fuel injection system can achieve better engine combustion and performance than current IC engines. This paper reports the preliminary analysis of the LSRM engine. The advantages and anticipated problems are discussed based on a comparison of the LSRM engine and the conventional IC engine. The potential problem of heat loss, which may be caused by the low engine operational speed, was examined through thermodynamic cycle analysis. The results of this analysis show that the heat loss from the LSRM engine will be in the normal range experienced by conventional IC engines if the ambient air is used as the cooling medium. Copyright © 1999 Society of Automotive Engineers, Inc.
Mallinson, SG, Hong, G & Reizes, JA 1999, 'Some characteristics of synthetic jets', 30th Fluid Dynamics Conference. © 1999 by S.G. Mallinson. Published by the American Institute for Aeronautics and Astronautics with permission. The synthetic jet actuator is a novel means of applying flow control that lends itself to use as part of the emerging area of micro-electro-mechanical systems. The synthetic jet flow generated by a circular orifice is investigated here using experimental and computational approaches. It is found that the synthetic jet behaves in a similar manner to a steady turbulent jet, except that it forms much more rapidly. This is a consequence of the increased entrainment of ambient fluid which arises because of the pulsatile nature of the flow. The flow achieves a pseudo-steady state because of turbulent dissipation near the jet orifice. It is observed that when the membrane forcing frequency is varied, the response as measured by the jet velocity exhibits strong peaks due to the acoustic and structural properties of the actuator. Further, the maximum velocity for a particular actuator configuration would seem to depend on a balance between inertia and viscous forces. The exhaust noise of a two-cylinder four-stroke diesel engine was experimentally investigated in order to examine the predictability of the exhaust noise to be reduced by a feedforward active control system. Special attention has been paid to the low frequency characteristics of the exhaust noise as low frequency noise is difficult to reduce with a conventional muffler but effective to control by active control technique. The periodicity of the exhaust noise was examined with the ensemble-average and ensemble-standard deviation of the exhaust pressure signals. The results showed that the exhaust noise investigated was basically quasi-periodic and its variation between cycles was acceptable with an adaptive control algorithm. The properties of the exhaust pressure in low frequency domain were analyzed with the spectra of the exhaust noise pressure. A method to estimate the instantaneous exhaust noise pressure proposed by the author in 1996 was applied to this diesel engine by estimating a limited number N of low frequency harmonics in terms of engine speed and load. This method matches the active control system by its fast response. The predicted and experimental results agree well and show that the prediction method is valid and the exhaust noise pressure is predictable with this method. © 1998 Society of Automotive Engineers, Inc.
Mallison, SG, Hong, G & Reizes, JA 1998, 'Fundamental studies of a synthetic jet actuator', Proceedings of the 1998 Thirteenth Australasian Fluid Mechanics Conference, Melbourne, Australia, 13-18 December 1998, pp. 329-332. The flow generated by a synthetic jet actuator is investigated experimentally and computationally. The experimental data and computational predictions show good agreement with the theory for a steady turbulent jet. It is found, however, that the synthetic jet establishes itself much more rapidly than the steady jet, and this is thought to be the result of turbulent dissipation causing a vortex to be trapped near the actuator orifice. Also, the optimal forcing frequency was found to be in agreement with a coupled fluid-structural interaction model. Gostelow, JP, Walker, GJ, Solomon, WJ, Hong, G & Melwani, N 1996, 'Investigation of the calmed region behind a turbulent spot', American Society of Mechanical Engineers (Paper). Measurements are presented of the calmed region behind triggered wave packets and turbulent spots under a controlled diffusion adverse pressure gradient in a wind tunnel. Similar measurements are also presented from the stator blades of an axial flow compressor, where turbulent spots are induced by the passing of rotor wakes. The purpose is to gain an appreciation of turbulent spot behavior under a strong adverse pressure gradient as a foundation for the more accurate modeling of spots and their environment in predictions of transitional boundary layer flows. Under an adverse pressure gradient the calmed region behind the spot is extensive; its interaction with the surrounding turbulent layer is complex and is dependent on whether the surrounding natural boundary layer is laminar or turbulent. Some insights are gleaned concerning the behavior of the calmed region which will subsequently be used in attempts to model the calmed region. Although these fundamental investigations of the calmed region have been extensive much remains to be understood. Copyright © 1996 by ASME. Measurements are presented of the calmed region behind triggered wave packets and turbulent spots under a controlled diffusion adverse pressure gradient in a wind tunnel. Similar measurements are also presented from the stator blades of an axial flow compressor, where turbulent spots are induced by the passing of rotor wakes. The purpose is to gain an appreciation of turbulent spot behavior under a strong adverse pressure gradient as a foundation for the more accurate modeling of spots and their environment in predictions of transitional boundary layer flows. under an adverse pressure gradient the calmed region behind the spot is extensive; its interaction with the surrounding turbulent layer is complex and is dependent on whether the surrounding natural boundary layer is laminar or turbulent. Some insights are gleaned concerning the behavior of the calmed region which will subsequently be used in attempts to model the calmed region. Although these fundamental investigations of the calmed region have been extensive much remains to be understood. Hong, G 1995, 'Structure of an artificial turbulent spot in a transitional boundary layer', American Society of Mechanical Engineers, Fluids Engineering Division (Publication) FED, pp. 33-38. Measurements of the longitudinal velocity were made in a final stage spot artificially generated in a laminar boundary layer at zero pressure gradient. The Blasius velocity profile of the laminar boundary layer was taken as a reference to observe the turbulent spot. The structure of the spot was identified with the profile of the velocity perturbation which is the deviation of the ensemble-averaged velocity of the spot from the velocity of the laminar flow surrounding the spot. The identification results of the velocity perturbation at the central stream line on a y-t plan support that a turbulent spot is, in large scale, a single vortex moving and growing downstream in the laminar boundary layer. The streamwise velocity perturbation of the turbulent spot from the experiments is compared with that of a vortex numerically generated by a CFD code in order to verify the single vortex structure. Similarities between the artificial and spontaneous spots are examined with streamwise velocity traces and integral properties of the boundary layer. The role of turbulent spots under zero and adverse pressure gradients is briefly discussed. Gostelow, JP, Hong, G, Walker, GJ & Dey, J 1994, 'Modeling of boundary layer transition in turbulent flows by linear combination integral method', American Society of Mechanical Engineers (Paper), pp. 1-7. Transitional boundary layer parameters in zero and variable pressure gradient flows, typical of turbomachinery applications, are predicted using an integral method of the linear combination type. The code used is that of Dey and Narasimha and the turbulent layer is calculated by a lag-entrainment method. The predictions of test data represent an improvement upon earlier methods; although reasonable agreement is obtained for these low Reynolds number test cases further refinement of predictive correlations to account for free-stream turbulence effects on laminar boundary layers and transition inception is indicated. The transitional parameters are found to be particularly sensitive to the initial conditions selected for the turbulent layer. Techniques are identified for overcoming this sensitivity and for adequately representing the transition region. Free-stream turbulence effects are quite strong, particularly on the velocity profile of the laminar layer. Modifications to laminar methods are advocated to account for the strong effects on the velocity profile and the early formation of turbulent spots. Copyright © 1994 by ASME. Transitional boundary layer parameters in zero and variable pressure gradient flows, typical of turbomachinery applications, are predicted using an integral method of the linear combination type. The code used is that of Dey and Narasimha and the turbulent layer is calculated by a lag-entrainment method. The predictions of test data represent an improvement upon earlier methods; although reasonable agreement is obtained for these low Reynolds number test cases further refinement of predictive correlations to account for free-stream turbulence effects on laminar boundary layers and transition inception is indicated. The transitional parameters are found to be particularly sensitive to the initial conditions selected for the turbulent layer. Techniques are identified for overcoming this sensitivity and for adequately representing the transition region. Free-stream turbulence effects are quite strong, particularly on the velocity profile of the laminar layer. Modifications to laminar methods are advocated to account for the strong effects on the velocity profile and the early formation of turbulent spots. Copyright © 1993 by ASME. Triggered turbulent spots are under investigation in a wind tunnel. A turbulent spot was initiated in a flat plate boundary layer under a moderate adverse pressure gradient. The spot was traversed at four streamwise locations using conventional hotwire anemometry techniques. A triggering jet provided a phase reference for data sampling. Phase-averaged velocity traces, boundary layer integral properties and contours of velocity perturbation and disturbance level are presented. The central region resembles a zero pressure gradient spot but much of the span is dominated by the different behavioral stages of a stongly-amplified wave packet. The celerities of the spot leading and trailing edges under an adverse pressure gradient are significantly lower than those associated with zero pressure gradient spots but the lateral spreading rate is much higher. This combination of turbulent spot and wave packet, which spreads at an included angle as high as 60° is quite different from the well-documented zero pressure gradient spot spreading at an included angle of about 20°. Improvements in transition region predictions are therefore dependent on further detailed measurements of spots and wave packets under adverse pressure gradients. Two kinds of self-tuning control algorithms have been applied using a novel smoke sensor as part of a diesel smoke control system. Firstly, pole assignment self-tuning control was used to achieve the desired engine speed response, with a smoke predictor used to solve the problems caused by the time delay between the fuel input and smoke output; secondly, a Pl self-tuning controller was used to solve the problem caused by the variation of the coefficients in the transfer functions with engine conditions. The experimental results and the problems and the ideas for future work are discussed. Copyright © 1990 Society of Automotive Engineers, Inc.
A novel smoke sensor was used to realize smoke feedback control on a diesel engine. The controller design based on a combination of PI control algorithm and the engine performance optimization is described. Experimental results demonstrate how this control system behave to meet both of the speed and smoke requirements during engine transients. A novel smoke sensor was used to measure the smoke response to the fuel rack on a diesel engine. The conventional modelling methods used for engine control were investigated. The synchronization technique and Recursive Least Square method were applied to engine modelling and two models for controller design were derived. A novel real time smoke sensor is described, which is mounted in the exhaust manifold and detects the smoke by virtue of the natural electrical charge which is carried on the smoke. The somewhat obscure origin of the charge on the smoke is briefly considered, as well as the operation of the sensor itself. The use of the sensor as part of a feedback control shows that it can be very effective in reducing smoke puffs. Copyright © 1987 Society of Automotive Engineers, Inc.